Download MCQs based solved paper of previous semester’s examinations of quantitative techniques February 2012. Total 70 multiple choice answers type questions. Every question is solved in detail such as which one out of given choices is the right answer and how to solve the question? This question paper itself is the examination preparation. 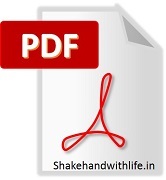 Students appearing for MBA examination must download this paper. Total 70 multiple choice answers type questions. Every question is solved in detail such as which one out of given choices is the right answer and how to solve the question? The question paper is based on the following topics of Quantitative Techniques; functions, arithmetic progression, geometric progression, matrix, measures of central tendency, measures of dispersion, skewness, correlation analysis, regression analysis, time series analysis, probability and probability distributions.